If you look at my account, you will see that I am a very active Amazon customer. Additionally, I had been linking Amazon books via my blog and am an Amazon Associate. 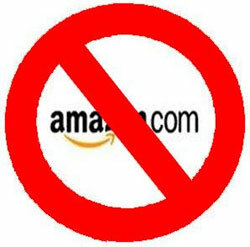 In response to Amazon’s absurd removal of Confederate flag-related merchandise in contemptible obedience to the whims of the radical left, I will be removing my blog links to Amazon and purchasing absolutely nothing from Amazon for one month. I’m sending a similar email to Ebay, where I am also a very active customer. I don’t actually shop at KMart or Walmart, and I mean to make a point of continuing not to do so. I used to reload ammunition, decades ago, when I was young and poor and keen. Like many people, over the years I became busier and more prosperous. I never reloaded anything, and I finally gave away all my tools and supplies. Farewell, Herter’s powder measure and scale and Pacific press! I got outbid back in the 1980s, in the auction of John Amber’s gun collection, for a Krag customized by A.O. Neidner, and I’ve had a hankering for a Neidner custom rifle ever since. Last Fall, I ran into a Neidner-built Mauser with a special barrel by the legendary old-time Tucson barrel-maker Bill Sukalle on Gun Broker. It was of unknown chambering, but it was a Neidner with extra Sukalle on the side, so I just had to buy it. Of course, it turned out that the rifle had been made before 1930 and chambered in a wildcat cartridge invented by Major Ned Roberts, the .25 Roberts, that was modified slightly* and commercialized by Remington in 1934 as the .257 Roberts. So I’ve been studying on how to modify 7×57 Mauser brass and gradually picking up loading tools and supplies in order to feed that Neidner rifle. My acquisition agenda has me looking at used loading tools on Ebay, and (as everybody knows) Ebay thoughtfully arranges for items similar to those you have been looking at to pop up to tempt you. Recently, via that Ebay policy, I came across the strangest thing. It was Ebay item number 121584408509 (this link will only function for for so many weeks, until Ebay gets rid of the expired listing). 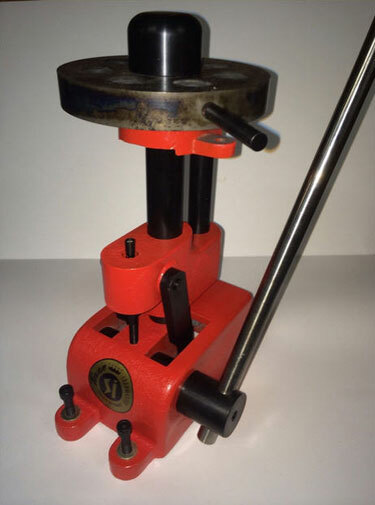 Here is a restored Texan loadmaster turret reloading press. This is circa early 1960’s and in excellent overall condition. The shafts have been re-blued as has the top turret cap by Turnbull restoration and the turret has been color case hardened. The main driving tumbler has also been re-blued and the body has been sand blasted and re-painted with VHT wrinkle paint to simulate the original finish. The decal too is a new reproduction that is smaller than the originals. Finally, the handle has been turned out of stainless steel as the originals were prone to bending. It does NOT come with the priming system normally available with these. It also has no shell holders and only one priming arm. This was rebuilt to reload – or you can just sit there and look at it. It’s up to you. No international shipping – and no returns. Ebay shoved in front of my nose a massive old turreted loading press from the 1960s by a completely unheard of manufacturer. I used to load when I was in high school in the 1960s, so I’m basically familiar with the standard companies which made loading gear, Lyman and Lee, Reddding and RCBS, Hornaday, Pacific and Herter’s (both now gone). But I never heard of a Texas Loadmaster. The bid was already up to $214.50, with a few days to go, which I thought extraordinary for an ancient 1960s model loading press. You can buy brand-new top end turret presses all day for that kind of money. But what was really bizarre was the seller’s statement that this press had been painstakingly restored by Turnbull Restoration. Turnbull Restoration, of course, is a really high-end company, renowned for their unequaled case hardening, which produces extremely beautiful and extremely expensive replica Winchester Model 1886s and Colt 1911s. What could possibly have possessed somebody to ship off some obscure 1960s loading press to Turnbull for a top-quality restoration? That kind of work by Turnbull undoubtedly costs roughly all the tea in China. For what that must have cost you could buy a large pile of brand-new, 50-years-improved current presses and still have change for a beer. I was tempted to bid on it. The winner would obviously be getting thousands of dollars of restoration work for some hundreds of dollars, but… When I Googled “Texas Loadmaster”, I couldn’t find anything. All that came up was a new “Loadmaster” press by Lee. 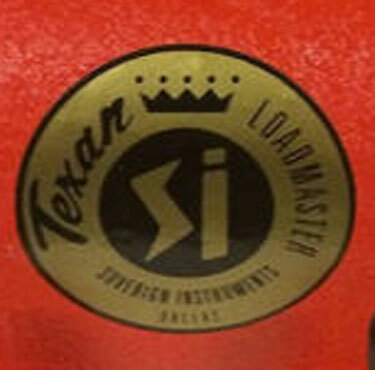 I had to search under “Sovereign Instruments Texas Loadmaster”, and I still found only minimal information. Upon reflection, I concluded that this press was certainly missing parts. I felt sure I could never locate a manual or any parts for it, so what would I do if it needed special shell holders or die bushings? Bidding ended where it was yesterday, at $214.50. Did someone get the bargain of the century? I doubt it, but who knows? Anyway, I thought I would write all this up, and throw the mystery out there. The Internet being what it is, you never know. Somebody may come along who can supply the answer to the question of why would anyone restore that press? *Remington saved work by skipping the original shortening of the 7×57 Mauser case by 1/16″, moved forward the shoulder angle and changed the angle from 15 degrees to a sharper 20 degrees. Ebay lot 381041066398 was sitting there at $230.00 on Saturday as the auction drew toward its close at 8:27 pm. I had just bought a rifle on Gun Broker, so I was feeling a need for some restraint, but I certainly was not going to let this sell for $230.00 without bidding a bit higher. So I left an Esnipe bid somewhere near $300. It’s impossible to tell what some auctions are going to do in their final moments, when all the snipers open fire. You can bid double the current bid sometimes and still find that you came in too low. I had no idea what this dagger would fetch. It was obviously worth a great deal more than $230, but beyond that I hadn’t a clue. It sold, as things turned out, for $599.90, and I still think it was worth much more than that. You are bidding on an antique Italian hunting knife. This is an exceptional example well made and well preserved. It probably dates from the first half of the 19th century. It is large 15-1/2 inches long, solid blade 11 inches long with two decorative fullers and mirror engraved images as well as a small section of brass inlay, the blade is 2 inches wide at the base. The handle is made from wood with two decorative brass side grips and a very interesting tang section that can be seen on the back. Nice file work on the mid section. Super nice knife. But, what was it really? I looked through George Cameron Stone’s A Glossary of the Construction, Decoration and Use of Arms and Armor in All Countries and in All Times, Together with Some Closely Related Subjects, and my conclusion is that it was an anelace aka anelec aka anlace, a long dagger variation of the cinquedea featuring a triangular double-edged blade tapering sharply to a point: used from the 13th to the 16th centuries. This weapon was often carried at an angle at the small of the back and would be the only weapon carried in cities, at court, traveling on horseback or riding during the hunt, also used to slide between the plates of platemail armour. It does not look old enough to me to be 16th century. It has an 18th century look to me. But, I suppose, it might have been an extremely high quality 19th century reproduction. 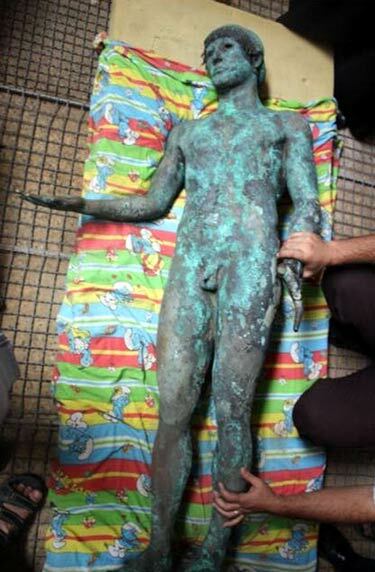 It seems that, either on land in Gaza or under the sea nearby, last summer, some ignorant and greedy barbarians came into possession of an unusually intact and highly artistically significant Hellenistic bronze statue of Apollo. Reports differ, but apparently the priceless statue was briefly being offered on Ebay for $500,000, probably only a fraction of its actual value. Its finder, we are told, chopped off a few fingers for testing, thinking that the statue might be gold. Police representing the Palestinian authority, Hamas, subsequently seized the statue, and it has disappeared. We can only hope that the nearby civilized state of Israel will take steps to secure possession of this important art object on behalf of the rest of the nations of the West. A Georgia antiques collector is the latest person to claim that he might have found the original recipe for Coca-Cola. Cliff Kluge and his wife Arlene recently bought a box of letters at an estate sale, and one of the yellowed papers, dated 1943, includes instructions for making cola, according to Atlanta’s WXIA. Kluge thinks it could potentially be the recipe for Coca-Cola and is trying to sell it on eBay; bidding starts at $5 million, but customers can buy it now for $15 million. On May 8th, 1886, Dr. John Stythe Pemberton, a pharmacist and inventor of medicinal beverages, invented the world’s most famous drink – Coca Cola. Shortly after, he began selling the fountain drink in a nearby Atlanta pharmacy. Concocted in a brass kettle in his back yard, this patent medicine was billed as being able to cure anything from morphine addiction to headaches to impotence.The ingredients, their ratio and the process method of the beverage is one ofthe most closely guarded secrets in the world. To this day, it is said that only two of Coca Cola’s executives know the entire ingredients. In 1899, Benjamin F. Thomas and Joseph B. Whitehead of Chattanooga, met with Asa Chandler, then President and owner of the Coca Cola Company. They approached him with the idea of bottling the beverage. Until then, Coca Cola was only available as a fountain drink. After much negotiations, Mr. Chandler agreed to grant bottling rights to the two gentleman, for the astronomical fee of $1.00. (He never collected the $1.00, by the way) Thus born was the world’s first Coca Cola Bottling Company, located in Chattanooga, Tennessee. Fast forward 100+ years later to the 21st Century – we were at an estate sale of a deceased, renown Chattanooga chemist, who at one time worked at one of the more prominent chemical companies in the area. There were masses upon masses of personal paperwork at the sale. Curious, we bought several boxes of this paperwork, which yielded some interesting finds. Among those finds is what is offered for sale here – what we believe to be the formula for Coca Cola. Typed on January 15th, 1943, this single page (front and back) breaks down the formula into exact amounts of specific ingredients to make one gallon of concentrate, which, when combined and processed yields enough to make 16 gallons..
May we make this perfectly clear – we can never guarantee and never claim that this is the actual recipe for Coca Cola. Even if this formula was 100% accurate in every aspect– as mentioned above– there are only two people in the world that can verify it’s accuracy, and I doubt they will be willing to compromise Coca Cola to acknowledge our exactness. That is why we are selling this as a historic artifact. Though you’re looking at the “Swiss Cheese” version of that formula, with the ingredients edited out, you will be purchasing the entire recipe to include ingredients, ratios and preparation details. The formula is an interesting read in itself – including the Maywood Chemical Company, now the Stepan Chemical Company, which has the solitary right of decocanizing the coca leaves for Coca Cola. Indeed, until 1903, Coca Cola had an average of 9 milligrams of cocaine in each serving. No wonder it got rid of headaches. It is to our belief that the interest in this will be so great, that the questions through eBay will be monumental– so we ask “serious inquires only”. I will never reveal any portion of the formula in any shape or form, so don’t waste the energy asking. You may find the “Buy It Now” price exceptionally steep, but it will be a drop in the bucket if this formula rises to the occasion and yields an accurate formula for CocaCola – the most popular drink in the world , with over a billion served daily. A billion plus per day – my goodness. Update: It’s interesting to see how this is unfolding. 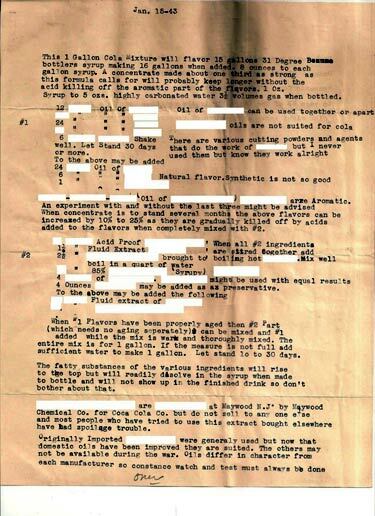 According to some news sources, it appears that during World War II (this letter is dated January 15, 1943) Coca Cola was concerned that they were not going to be able to obtain all the ingredients they needed to make the formula – either by war time shortages, or the countries where the ingredients came from were deep in battle and couldn’t meet supply demands. This is pure speculation – the estate we bought this from — this person was a renown chemist — is it possible that this informal letter was written to that chemist to find other avenues to reach the same tasting Coca Cola recipe? Personally, I don’t believe it was written to compromise Coca Cola or the formula. There is no doubt (at least in my mind) that whoever typed the letter had seen the original recipe for Coca Cola, and they reference that on the second page – “On page 83 of the Extractor….” Is it the original recipe? I don’t know, but more evidence and external factors are falling in place to bolster the fact that this could be the original, with an emphasis on the word “could”. Looking at the recipe, it certainly is a lot more complicated than I could have ever imagined. For sale: One Senate seat. Goes to the highest BLEEP-ing bidder. Seller’s positive feedback rating: since Tuesday, just about zero. Outraged by the arrest of Illinois Gov. Rod Blagojevich, more than a dozen people have put the state’s vacant Senate seat up for bid on eBay. The offers popped up on the Internet auction site after Blagojevich was accused Tuesday of trying to benefit financially from his power to appoint a Senate replacement to President-elect Barack Obama. Daniel Finnegan, a student at the University of Georgia, said he started an auction because he’s “extremely upset about what happened” and wants to voice his opinion. Finnegan says he’s glad others posted similar auctions so the accusations against Blagojevich don’t go unnoticed. And folks are bidding, some jokingly. One posting (“Used Illinois Senate seat, all wood and leather, willing to deal on this one! Please be advised I will be away from my office for a while…”), had 78 bids and was going for $99,999,999.00 Wednesday morning. Literal Senate seats have been eliminated as of this morning, but Internet domains named ObamaSenateSeat, newspaper clippings, and numerous joke references can be found. A second-hand camera sold on eBay by a top MI6 agent held secret records used in the fight against al-Qaeda terrorists. Names, snaps, fingerprints and suspects’ academic records were found in the memory of the digital device. Alongside them were photos of rocket launchers and missiles which spooks believe Iran is supplying to Osama Bin Laden’s henchmen in Iraq. And a hand-drawn graphic revealed links between active al-Qaeda cells — with terrorists’ names and occupations. Meanwhile a document marked “top secret” detailed the encrypted computer system used by real-life James Bonds working away from MI6’s London HQ. Among those named in the material was 46-year-old Abdul al-Hadi al-Iraqi, who was captured by the CIA in 2007. The fanatical Iraqi Kurd, one of al-Qaeda’s highest-ranking lieutenants, is being held by the US at Guantanamo Bay. The Nikon Coolpix camera was snapped up for just £17 on the auction website by an innocent 28-year-old deliveryman who lives with his mum. He discovered the secret material as he downloaded pictures from a US holiday at his home in Hemel Hempstead, Herts. A friend said: “He only bought the camera because he was going on holiday with his ex. “He flew home early this month and downloaded his holiday pictures and saw some of rocket launchers and missiles. The man walked into Hemel Hempstead Police Station to report the matter, but cops initially treated it as a joke. Yet within days Special Branch, the team of specialist anti-terror officers based in every county force, descended on his humble terraced home. They took away the camera and the family’s PC and spent £1,000 replacing them. Officers banned the shocked family from talking to the media. As it happens, I dislike UNIX and its kin because it is based on the premise that people should interact with computers through a “command line.” First the person does something, usually either by typing or clicking with a pointing device. And then, after an unspecified period of time, the computer does something, and then the cycle is repeated. That is how the Web works, and how everything works these days, because everything is based on those damned Linux servers. Even video games, which have a gloss of continuous movement, are based on an underlying logic that reflects the command line. Human cognition has been finely tuned in the deep time of evolution for continuous interaction with the world. Demoting the importance of timing is therefore a way of demoting all of human cognition and physicality except for the most abstract and least ambiguous aspects of language, the one thing we can do which is partially tolerant of timing uncertainty. It is only barely possible, but endlessly glitchy and compromising, to build Virtual Reality or other intimate conceptions of digital instrumentation (meaning those connected with the human sensory motor loop rather than abstractions mediated by language) using architectures like UNIX or Linux. But the horrible, limiting ideas of command line systems are now locked-in. We may never know what might have been. Software is like the movie “Groundhog Day,” in which each day is the same. The passage of time is trivialized. But, as is often the case in space ranges, there is some very good stuff in here. The concept of the Antigora, i.e., a privately owned marketplace whose owner benefits both from its use by, and from the volunteer labor of, entrants is potentially quite useful. Perhaps it will turn out that India and China are vulnerable. Google and other Antigoras will increasingly lower the billing rates of help desks. Robots will probably start to work well just as China’s population is aging dramatically, in about twenty years. China and India might suddenly be out of work! Now we enter the endgame feared by the Luddites, in which technology becomes so efficient that there aren’t any more jobs for people. But in this particular scenario, let’s say it also turns out to be true that even a person making a marginal income at the periphery of one of the Antigoras can survive, because the efficiencies make survival cheap. It’s 2025 in Cambodia, for instance, and you only make the equivalent of a buck a day, without health insurance, but the local Wal-Mart is cheaper every day and you can get a robot-designed robot to cut out your cancer for a quarter, so who cares? This is nothing but an extrapolation of the principle Wal-Mart is already demonstrating, according to some observers. Efficiencies concentrate wealth, and make the poor poorer by some relative measures, but their expenses are also brought down by the efficiencies. An amusing read and a fine provocation. John Perry Barlow, Eric S. Raymond, David Gelernter, and Glenn Reynolds will all be replying. Hat tip to Glenn Reynolds. the Archives of Never Yet Melted in the 'Ebay' Category.